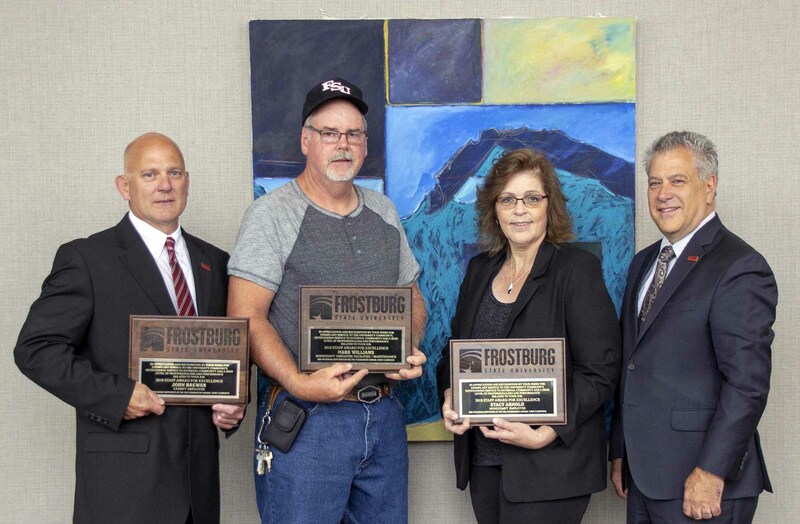 Frostburg State University honored three outstanding employees, John Brewer, Stacy Arnold and Mark Williams, at its recent State of the University presentation. The annual Staff Awards for Excellence recognize exceptional service to the institution. Recipients are nominated and chosen by their colleagues. This year’s award winners have served FSU for a combined total of 50 years. Brewer, the assistant director of Facilities, Planning/Construction and Housekeeping, was honored in the Exempt (salaried) employee category. An FSU employee for 18 years, he reconstructed the entire Housekeeping Department with the support of the FSU Executive Board and has worked on projects such as the new Stadium/Press Box, Public Safety Building and the Education and Health Sciences Building. Beyond his contributions at work, Brewer plays a significant role in his community through numerous organizations, including the Accident Zion Lutheran Church, and as the Fishing Tournament director, Little League vice president and coach, a member of the Garrett County Fair board of directors, 4-H volunteer and youth soccer coach. On campus as well as off campus, his work ethic, dedication and desire to please are extraordinary. Arnold, the IT Data Control supervisor, won the award in the Nonexempt Employee category. She is one of the few people on campus who interacts with all members of the campus and community, from students and parents to food vendors both on and off campus. Knowledgeable about multiple systems, she maintains the database for meals, bonus and bobcat dollars, building access and library codes. Arnold often must work into the evening on weekdays and continues her work on weekends to make sure everything is functioning properly. She is a true ambassador for the University and exemplifies what FSU wants from its employees – hard work and a welcoming attitude to every person who sets foot on campus. Williams was recognized in the Nonexempt Employee/Facilities/Maintenance category. A multi-trade chief I in the Physical Plant since May 1998, he is one of those people who can fix just about anything. Williams oversees a large majority of the work orders that the Multi-Trade Shop receives. He is a leader, and as such, is called upon regularly to consult on various issues that arise on campus. Williams is approachable and always willing to help with whatever needs to be done. In addition to his fine work on campus, he has been involved in the volunteer fire service for more than 33 years, currently serving as the deputy chief and financial officer for the Ellerslie Volunteer Fire Department. This year marks the 21st year the Staff Awards for Excellence have been presented. To date, 60 employees have been honored. Award recipients are given a plaque, a certificate commemorating their dedication and a monetary award. Staff Awards for Excellence are funded by the FSU Foundation’s Annual Fund Campaign. For more information, contact the FSU Office of Human Resources at 301-687-4105. From left, John Brewer, Mark Williams and Stacy Arnold pose with FSU President Ronald Nowaczyk after receiving their awards at the State of the University presentation.